"...I recall a magazine article where Vittorio De Sica's son, Christian, was hoping to make a film about the fasulo [fake, phoney] film his father made [during WWII]. Fasulo because the Vatican gave him money to keep a barn load of extras — who were really Jewish refugees — fed, clothed and busy. He had to keep filming, keep them moving, keep the authorities guessing, and at the end of the day, in memory of Penelope and her loom, to undo the thousands of feet of footage and start again the next day. I do not recall the name of the film which De Sica finally released (something on a train) but I do not think Christian was ever able to produce a film about the fasulo film..."
For La porta del cielo Orbis assigned De Sica a young priest as production supervisor who became the future pope Paul VI. By working for a production company so closely linked with the Vatican, De Sica's cast and production team were able to avoid requests from officials of the Republic of Salo to join the cinema productions underway in Venice, north of the invading Allied army. The special position that the Vatican enjoyed with regard to the Nazi/fascists also allowed De Sica to assemble an all-star cast for the film with actors such as Massimo Girotti and De Sica's future wife Maria Mercader. De Sica also prolonged filming, especially the final procession sequences in the Cathedral of St. Paul Beyond the Walls which doubles as the shrine at Loreto so that the numerous extras (Christian De Sica reports the number at about 1200) that included Jews and political dissidents could avoid being culled into wartime activities or even deported. In fact the film was completed and received a censorship clearance (visto di censura) on April 19,1945 just days before the end of the war. Other sources, including Vittorio De Sica, himself, in his memoirs and his son Christian, in his own autobiography (see passage, below), tell it differently. Some historical background is necessary: Italy surrendered to the Allies on September 8, 1943. By that date, the Allies had taken Sicily and were about to invade at Salerno, just south of Naples; thus, the Allies were already in physical control of about one-third of the peninsula. Part of the surrender treaty was that the reconstituted Italian armed forces would now fight with the Allies against the Germans. This threw Italy into a civil war with the Allied side slowly creeping up past Naples in late 1943 (only to remain blocked at Monte Cassino for many, many weeks. They had expected to liberate Rome by Christmas. It took until June, 1944). In the meantime, central and northern Italy remained firmly in the hands of Italian Fascists supported by the retreating but still considerable German military might. They formed (within two weeks of the Sept. 8 surrender) a new Italian Fascist state called the Italian Social Republic (also known as the Republic of Salò, a town on the shores of Lake Garda that functioned as the capital). 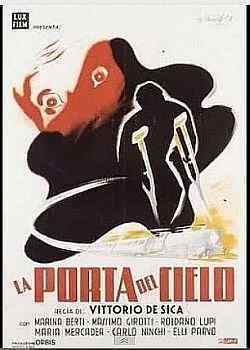 Shooting of La Porta started on March 1, 1944. Inside the Basilica of San Paolo...That's where they recreated the area around the church of Loreto and built the train that transported the sick. ..Dad even got Cesare [Zavattini] to rewrite the script... Zavattini, an atheist...wanted no part of writing any film about a miracle. He resisted and made a hell of a fuss. But he gave in. The screenplay of La Porta del cielo was written...by Zavattini, Adolfo Franci e Diego Fabbri, that Catholic, well-known in the Curia, and who was supposed to guarantee orthodoxy. In spite of that, the Catholic hierarchy was disappointed. Some of Zavattini's impetuous ideas, supported by my father got the upper hand. In the script, the miracle didn't happen. The sick became convinced that the miracle was not supposed to come from the Madonna but from within themselves, from their own will power and energy to survive—not by supernatural forces. Whose idea could that have been if not Cesare's? But the real miracle was something else. One source, Luigi Accattoli, a former writer on religious affairs for the Corriere della Sera, criticizes various parts of Christian De Sica's account. The film was made in the Abbey of St. Paul, not the Basilica, he says, and he calls the scene between Vittorio De Sica and the future pope "improbable." Other than that, however, he says that the episode is substantially true. Minister Goebbels, through his ambassador in Rome, called to invite me to direct German film-making in Prague. At the same time, our Minister of Popular Culture, Mezzasomo, invited me to direct film-making for the Social Republic in Venice. I was terrified. There was a curfew in Rome, and at five in the afternoon we were all locked up in our homes. At exactly five minutes past five, the phone rings, and Cocco, a production director of profoundly Fascist sentiments, casually says to me, "So, de Sica, what have you decided about Venice?" I, just as casually, replied, "First, I have to finish this film that the Vatican commissioned me to do, la Porta del Cielo." That film saved me and my fellow actors since all of them, or almost all of them, wanted to be written into it even for the smallest part. It took almost a year to make the film. And I kept telling people that I could not go to Prague or Venice because I absolutely had to finish the film that the Catholic Cinematographic Center expected from me. We filmed in the basement of a church in the Salario quarter. As a matter of fact, since there was always the danger of German round-ups, we even locked ourselves in down there with food and blankets. While Cervi, poor Cialente, Girotti, Stoppa and I planned how to get organized, Stoppa, likeable egotist that he is, had taken the Spanish actress, Maria Mercader aside and promised her a lot of money if she could somehow find him asylum in the Spanish embassy. She, honest and sincere as she is, came and told us about it, and we were all over Stoppa with insults. Yet, we still remain friends, and I think that today, he may be one of the few dear friends that I have. Since we couldn't go to Loreto to film the final sequence of the film, I asked the parish bishop of the basilica of St. Paul if he would let me film the scene in the basilca. He agreed on the condition that I take responsibilty for serious and respectful behavior by the large number of extras that would be required for the scene. How could I get 2,000 uncouth hot-heads to act with respect for a place where such disgusting things were happening? While the bombings got worse, preceding by a few days the actual entrance of the Americans into Rome, my cast of faithful for the miracle of Loreto were going to the toilet behind columns in the church and using confessionals to make love in, and I was up on the crane with the camera ignoring this disgrace and shouting, "Come on! Sing, sing—Jesus, resurrected Jesus, protect us, too, protect us, too." Yet I was moved by the marvelously strong way the scene came out. On the way out of the basilica, I wanted to thank the bishop personally. He refused to shake my hand and politely asked me to leave his office. The Americans had entered Rome. ...at the Jewish Center for Documentation in Milan, there is no information on the subject. In the Jewish community of Rome, there are also no documents or testimonies about Jews who were saved in the production of de Sica's film. How is it possible that 57 years after the war, the activities of the esteemed actor and director have not been recognized? Jewish community leaders say that it is possible that in the masses who took the opportunity to flee to the Vatican were Jews who were acting of their own accord, and not as part of de Sica's plan. Only the Vatican, which apparently has in its possession the list of the participants in the film, can clarify whether de Sica did indeed rescue Jews. In Italy, hardly anyone doubts that La Porta da Cielo helped save many inhabitants of Rome, both Jews and Christians. As for the Christian De Sica's film about the film, in which he will play the part of his father, he has talked about making the film for at least 15 years and reports from 2002-4 said that the film was about to be made. Then, De Sica got in a legal battle with the producers of another film, A luce spenta, a film with a similar tale to tell. De Sica claimed plagiarism. I don't know how the lawsuit was resolved or even if it ever was; in any event, he apparently decided not to do the film right then. I read an interview with him from 2011 and he said he had everything worked out and was going to make the film. Indeed, some film sources actually list La Porta del Cielo (2012). But I don't think it has been released. I went to the producer's website, Indiana Production; La Porta del Cielo is listed under "line" titles, which apparently means "in production" or "to be released". To me, in spite of the different accounts of the details, the substance still rings true to me —Vittorio De Sica risked his own life to save many others, and I am happy to believe that that is true. —Accattoli, Luigi (2010, Apr). "Il regista De Sica gira un film con ebrei e perseguitati". On-line Luigi Accattoli blog. —Celli, Carlo Celli (2001). "A lost De Sica film—La porta del cielo/The Gate of Heaven (1945) in Quarterly Review of Film and Video, 18:4, 361-369. —De Sica, Vittorio (2004). La porta del cielo. Memorie 1901-1952, Avagliano, Cava de' Tirreni [Salerno]. —Liberanome, Hulda (2002). "Through the gate of heaven, a second time" in on-line newspaper, Haaretz, Aug.16, 2002. —Melloni, Alberto (2008, Nov. 18). "De Sica, il finto film e gli ebrei salvati" in Corriere della Sera. —Nuzzi, Paolo and Ottavio Iemma (1997). De Sica & Zavattini: Parliamo Tanto Di Noi. Editori riuniti. —Riccardi, Andrea (2008). L’inverno più lungo. 1943-44: Pio XII, gli ebrei e i nazisti a Roma. pp. 179-187, Laterza, Rome, Bari. Once again, my thanks to Laura Papallo for making me aware of this subject.